Of late I've had a sudden affinity toward light fixtures. I'm not certain if it's because we have boring builder-grade lights throughout our house and recently took a jump off the (crazy!) 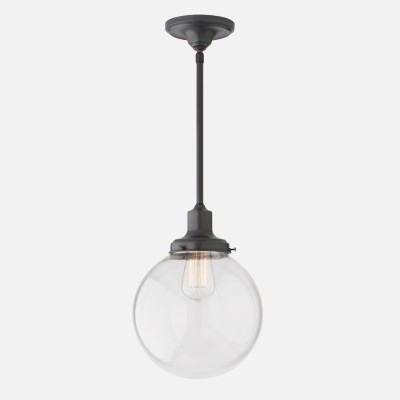 deep end and installed a new light fixture in the dining room (a future post...), or if I'm drawn to light fixtures because we live in Portland and lighting is a true luxury with our constantly clouded skies. Either way, I'm on a lighting kick and have found some fabulous pendant lights to share with you! 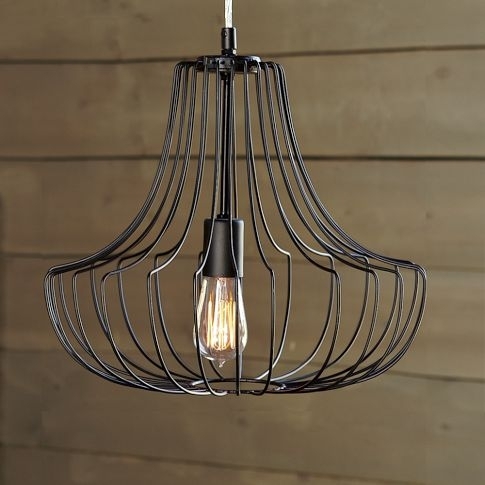 The West Elm Small Wire Pendant ($99) adds an eclectic industrial vibe to any space. Quite large for being "small" it's 16 inches in diameter, so it's plenty large to put above a dining table. It also comes in a cool white. 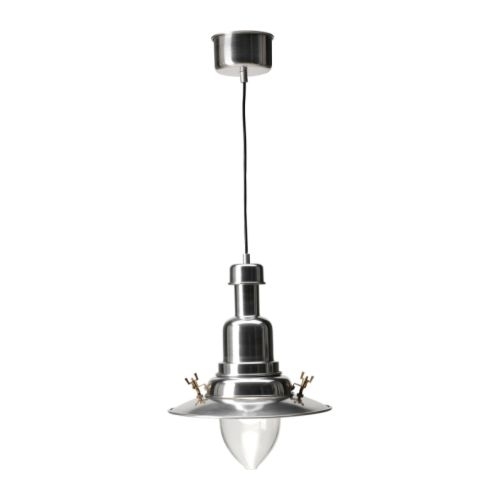 The Ikea Ottava Pendant Lamp ($30) is a great price and would look amazing in a pair or trio hanging over a kitchen island or peninsula. It has a hip old-school kitchen/nautical vibe, but remains a classic shape that won't go out of style. 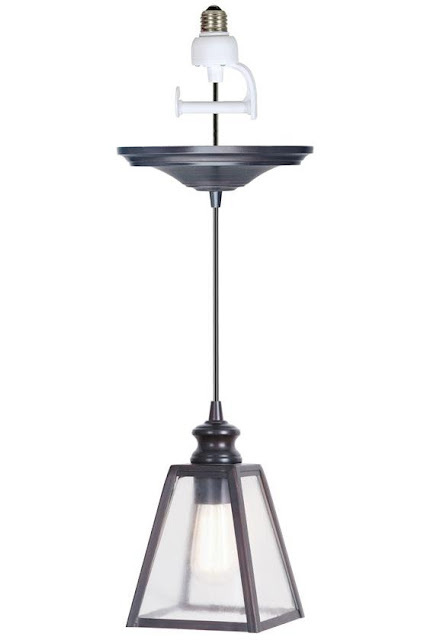 The Schoolhouse Electric Harding Pendant ($165) is a clean-lined pendant that goes with any decor style. It looks great with an Edison bulb for some added character. 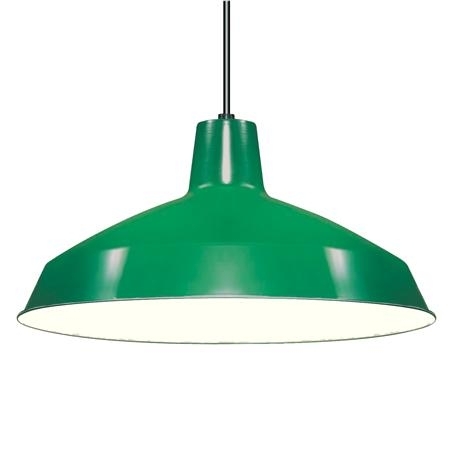 I'm loving the shamrock green color of this Shades of Light Loft Shade Pendant ($69). It also comes in 5 other colors - red, white, black, nickel, and bronze. Let this be the color focal point of an other-wise neutral space. 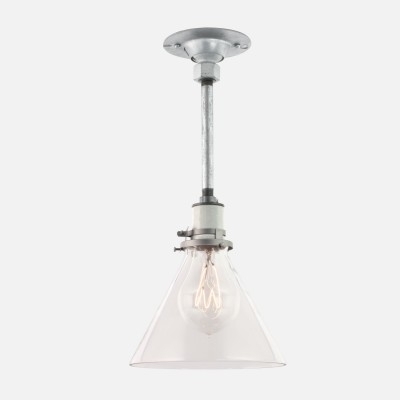 This Schoolhouse Electric Azusa Pendant ($99) has an refined industrial look with it's conical glass shade (sold separately) and hardware-looking galvanized canopy and rod. 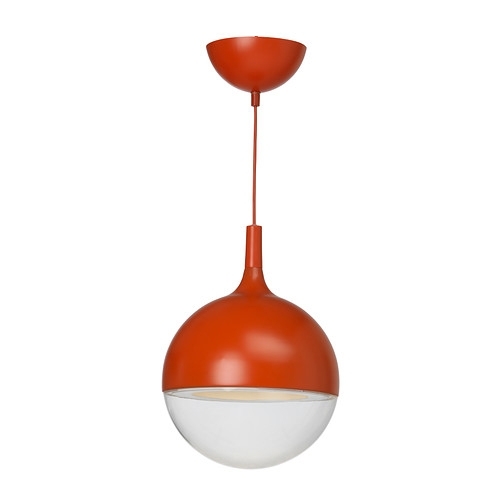 To add a little lipstick red to your life, take a step on the wild side with this Ikea Vaster Pendant Lamp ($90) with built-in long-life LED bulb. With a 16" diameter, it's a substantial fixture that would look really cool in a reading nook or as a focal point in a bathroom. 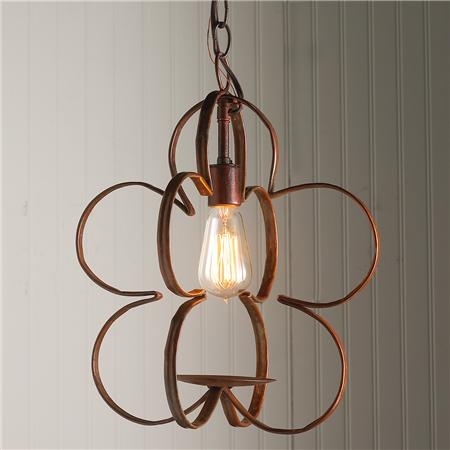 A beautiful shape, the Shades of Light Quatrefoil Pendant ($119) would be the perfect pick-me-up touch of light in an entry-way, a hallway, or laundry room. It's rust-colored patina melds well with any other metal finishes you may have in your home. Don't feel like all hardware needs to be the same metal - a mix of metals makes any space look more collected and eclectically refined. 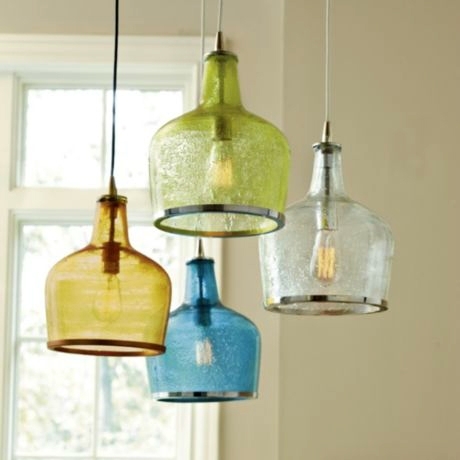 The mouth-blown glass Addie Pendant from Home Decorator's Collection ($129 each) comes in all four pictured colors. Hang in a multi-colored grouping as shown or stick with a more mono-chromatic look with a single color choice. Either way, they add the perfect touch of classical whimsy to any room. I'm loving them all, and now need to figure out which ones I want to order for 2 of my recessed lights hanging over the sink peninsula in my kitchen. Choices choices...so glad they're so affordable too! 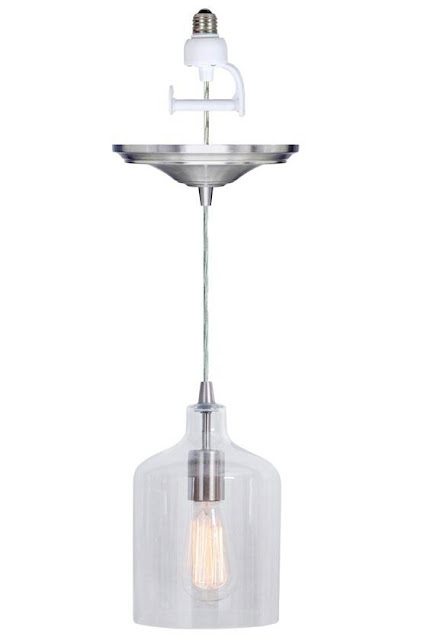 Which of these pendant lights is your fave? 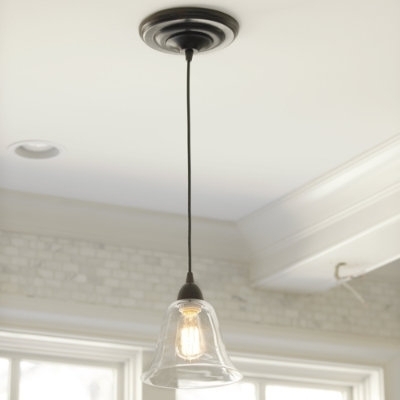 Let me know which ones are inspiring you to join the light fixture craze. The pendant conversions are fantastic, love them all! Please Vote for Inspired Whims!